Android Nougat also known as Android N is the new upcoming flagship mobile OS from Google. There is a great buzz around new Android 7.0 version for mobile devices which has already received developer preview release mainly on Nexus devices. Here we are going to show you how to download and install Android N emulator for Windows 10 PC, however, one thing in mind that Android N is still in developer preview stage and some bugs are expected, and this emulator tool is basically targeted at developers to try new Android N on Windows 10 (32bit/64bit) PC. This Android N emulator works similar to BlueStacks on Windows PC to play Android apps and games but with more advanced feature that are expected to arrive with full final version later this year. If you can’t wait to try Android N on mobile devices then you can sing up for OTA update but remember that this update might contain some bugs as it is still in testing stage. If you don’t mind taking risks then go ahead and install Android N on mobiles. But there is also a way of using Android N on PC by following instructions in this guide. So far Android can only be installed and tested on Nexus devices, however, there is a way of playing Android N on computer so that you can test developer preview version even without owning any Nexus device. You can download and install Android N on Windows 10 easily to try all new features of the upcoming Android OS 7.0 version without any need for buying Nexus device to try it. If you are thinking about flashing your phone with Android N then you are out of luck because it is not possible until the full final public version is released. So, if you have Windows PC at home, you can install it on computers via an emulator tool that turns your PC into a virtual Android device. 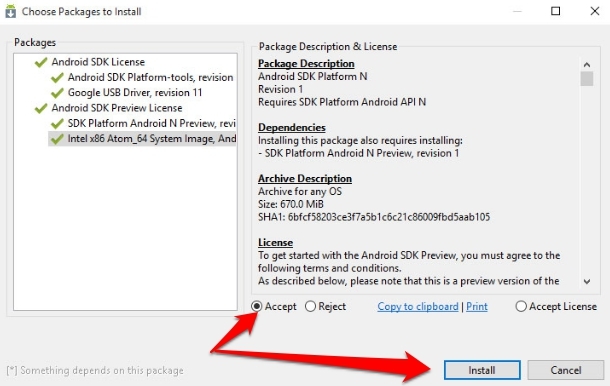 Here is what you need to do to play Android N features on PC: Download Android SDK, Android N firmware image and then install it on PC via Android Virtual Device (AVD) Android emulator tool. This is your best bet to enjoy Android N on PC. Now follow step-by-step instructions below to install Android N on PC. 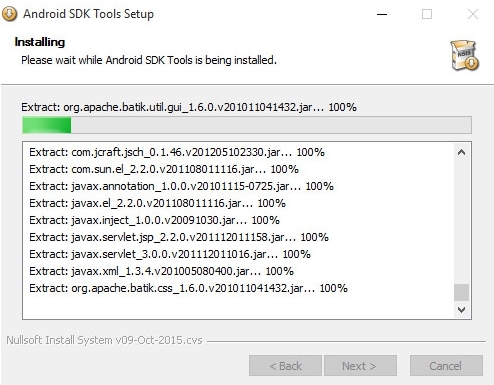 1 – Click on the link above to download and install Android SDK Manager installer file, click on it to install the tool and launch it. 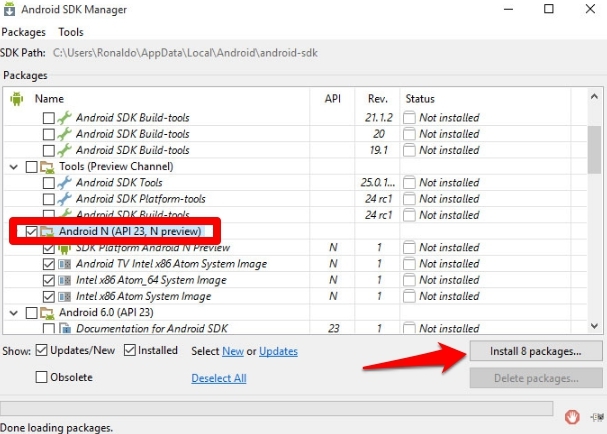 2 – On Android SDK Manager’s main screen, look for Android N (API 23, N preview) option, click/double-click on it, and under it check the third box on the list. Next click on Install Packages button. 3 – You should see a Setup window on the screen, click Accept to agree to package license and then hit Install button. After following above steps, carry on with instructions below. 1 – On the right side of ADV Manager window there is a Create button, click on it. 2 – Now you will be asked to create a new Android Virtual Device. Enter device model, storage space, RAM and other basic information and click OK.
3 – New Android Virtual Device will be created on PC. Click on it to Start. When you launch Android N emulator for the first time it takes a bit of time, be patient and wait for it to complete setup. If you PC is packed with updated hardware then Android N emulator setup and launch should take much time. There you go, now enjoy all best features of upcoming Google’s flagship OS Android N on Windows 10 computer.